This immense album is a hard one to describe with genre tags. It’s a mix of doom and thrash/heavy metal, but with elements of black, death, and progressive metal added in too, (as well as forays into dark ambient waters). The promo blurb mentions bands such as Celtic Frost, Bathory, Conan, and Pink Floyd; this is quite a mix, but not an inappropriate one, especially if you emphasise the Celtic Frost influences and take this as a stylistic base. This is a textured album that embraces multiple layers and feelings in its quest to be the darkest, blackest album it can. Shades of black are readily incorporated into the band’s artistic aesthetic, making for music that revels in its expressive doom/heavy/thrash metal framework. 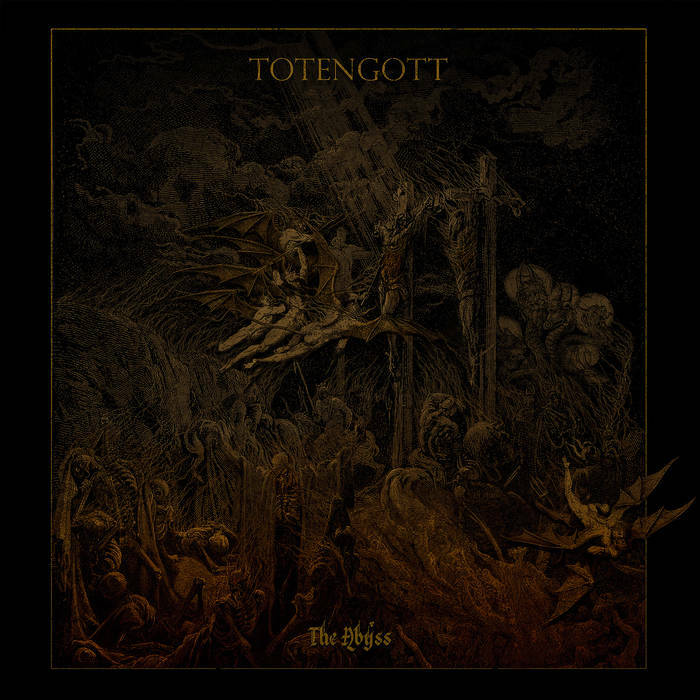 Totengott craft dark soundscapes from classic heavy metal, cover everything with a dark/doom metal crust, and then build with other elements mentioned above. The end result is four varied and engaging tracks that showcase what an individual proposition Totengott are well on the way to becoming. So, take modern Celtic Frost and Triptykon, force them deep into the underground, cover in darkness and filth, and you have a good idea of the type of ground that The Abyss covers. This entry was posted in Doom and tagged Bathory, Black metal, Celtic Frost, Conan, Dark Ambient, Dark Metal, Doom, Doom Metal, Heavy Metal, Metal, Pink Floyd, Progressive metal, Thrash metal, Totengott, Triptykon. Bookmark the permalink.